When you think of cities that attract architecture buffs, Barcelona, Istanbul, Dubai, Athens, and Chicago come to mind. All predate Palm Springs (even the New World’s Chicago incorporated 99 years and one month earlier). Yet people from England, France, Germany, the Netherlands, Japan, and China journeyed to the desert last February for Modernism Week — an indication of the global recognition the 8-year-old event has gained for our Mecca of midcentury design. Media from around the world have pounced on this remarkable achievement with great zeal. The quantity and superior quality of the architecture produced here is exceptional for a city of relatively small size (95 square miles) and population (45,000). A primary factor in the achievement is the fact that Palm Springs was — and to some extent still is — a second-home community. An architect’s role in designing a primary residence is riddled with numerous accommodations to satisfy the needs and functionality of a primary home. In Palm Springs, architects were liberated from those specific requirements, as well as the pressure and detailed demands that a primary residence requires. Architects took full advantage of the leeway granted them. 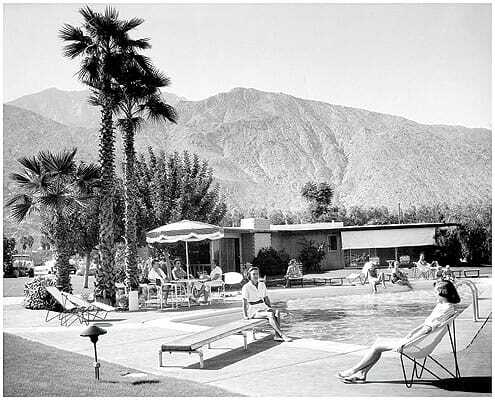 Palm Springs greatly expanded following World War II, when a groundswell of optimism inspired creative people in many fields. Architects in Palm Springs were eager to innovate and work in the modern idiom. And their clients let them do just that. 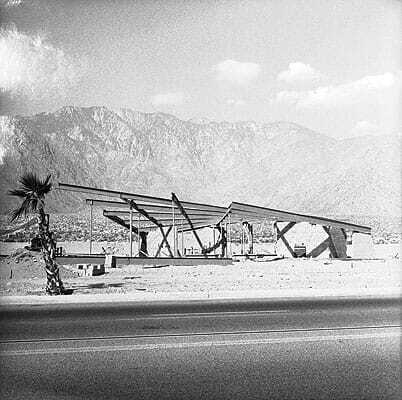 Donald Wexler was a beneficiary, being awarded the job of designing Palm Springs’ airport when he was in his 30s. Nature and culture exist in glorious harmony in Palm Springs, and architects were very sensitive to that. Mount San Jacinto rises in a steep escarpment, making it immediate in the landscape. In fact, the verticality of the mountainside made it impossible to build on. 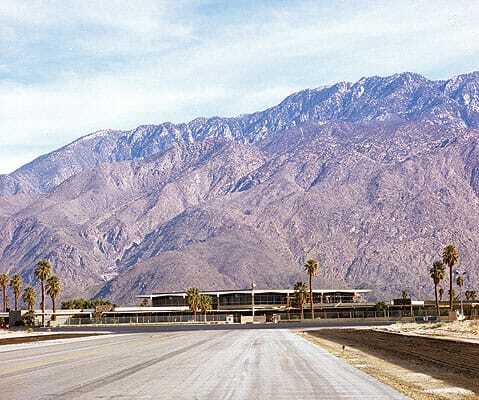 Architects responded with a focus on horizontal lines, always respectful of the magnificence of the San Jacinto Mountains. Similarly, they deferred to the natural coloration of their surroundings. The low desert’s mild winter climate allowed the architects to virtually erase barriers between interior and exterior, both physically (through the use of glass walls and sliding glass doors) and psychologically (by continuing interior walls, ceilings, and architectural features from the interior to the exterior). And developers, architects, and clients favored one-story residential structures that preserved everyone’s views of the mountains and provided backyard privacy. In Los Angeles, architecture often screams for attention. Palm Springs architects worked sotto voce, so that their work would be in harmony with, but not overshadow, the natural beauty of the desert. Many of the houses built during the midcentury are “discreet to the street,” meaning that their street presence only hints of the beauty one experiences upon entering them. Of course, there are striking examples where architects were specifically requested to create iconic structures. 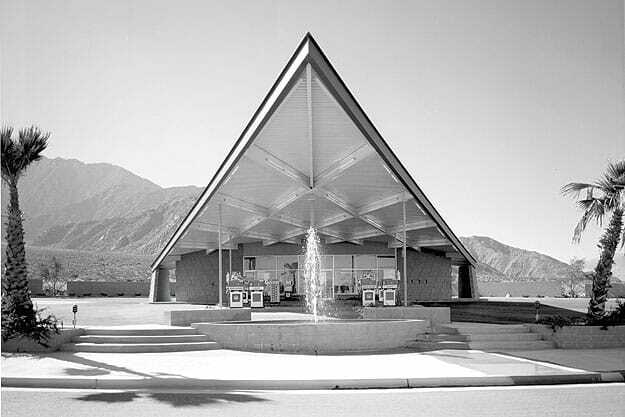 Albert Frey designed the Tramway Gas Station (1965) to stand apart from its surroundings. Its grand hyperbolic, parabaloid roof announces to visitors driving in from the interstate that they have arrived in a unique part of the world. The desire to lead the good life led many to choose the desert as their home. 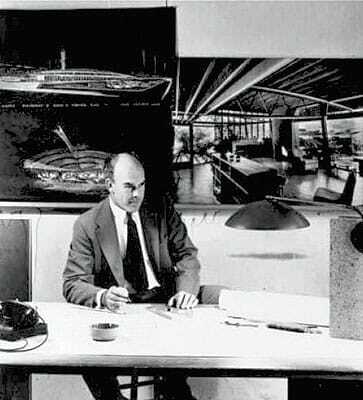 Frey worked with Le Corbusier in France and went on to New York, where he was poised to have a highly successful career with his business partner, Lawrence Kocher, editor of Architectural Record. 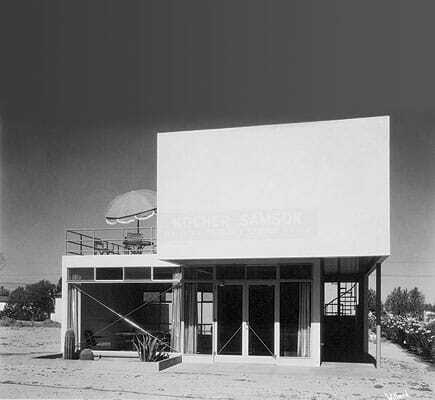 One of their firm’s commissions was a building in Palm Springs for Kocher’s brother, Dr. Jacob John Kocher. While working on that commission, Frey became enchanted with the desert, ultimately deciding to live here. His buildings are not about the use of lavish and expensive materials, but rather bringing innovation to elemental building materials (steel, concrete, glass, and corrugated metal). 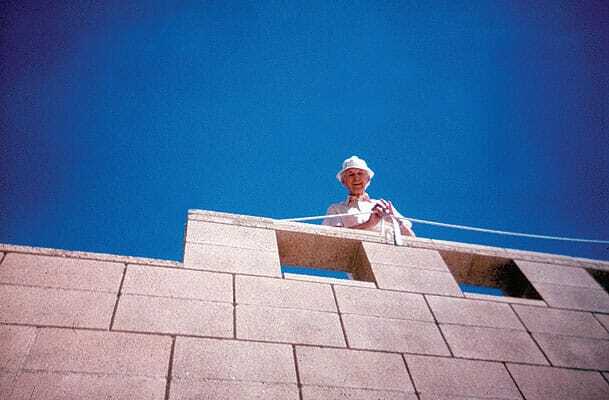 He was the first modernist with a dedicated practice in the desert. 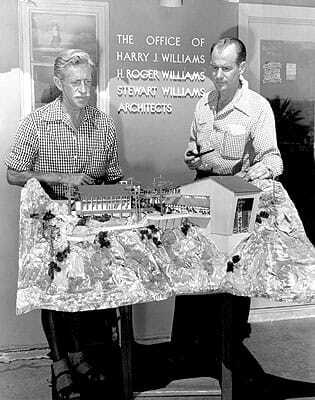 E. Stewart Williams, another of the founding fathers of the Palm Springs modern style, followed in the footsteps of his father, Harry Williams, who had come here to design downtown’s La Plaza for Julia Carnell, a client from his native Dayton, Ohio. E. Stewart Williams never desired to be the head of a huge firm. He had seen his father’s firm (Schenk and Williams, which at one point employed more than 100 architects) decimated by the Depression to the point where he was forced to sell ice cream cones on lonely street corners. 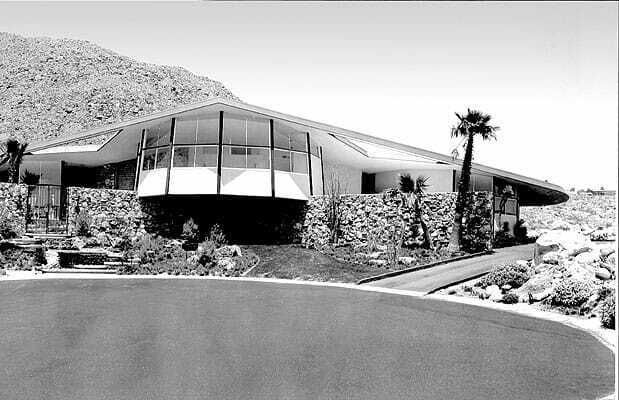 The family’s fortunes changed in Palm Springs, and Williams’ influence — creating a warm brand of modernism greatly influenced by the architecture of Scandinavia — produced many of Palm Springs’ most notable buildings, including a house for Frank Sinatra (his auspicious first residential commission). The general conception is that modern architecture is cold (à la Phillip Johnson’s classic Glass House in New Canaan, Conn.). Williams’ use of natural materials in many of his buildings resulted in structures that were warm, but utterly modern in their design. 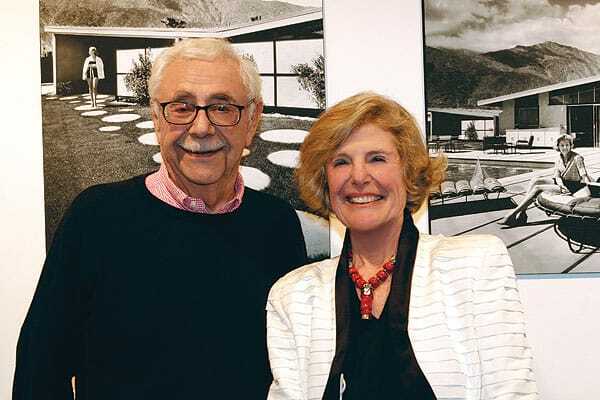 His former Santa Fe Savings Bank building has been purchased by Palm Springs Art Museum to become a dedicated museum of architecture and design. Another native of Dayton, William Cody came to California when his family moved to Los Angeles in the 1920s. While studying at the University of Southern California, Cody worked in the office of the architect widely credited with creating the modern California ranch house: Cliff May. An asthmatic, Cody moved to the desert with the hope that the dry air would alleviate his symptoms. His architecture is one of great refinement and a quest toward lithe, strikingly thin supports and rooflines for his buildings. He mastered the merging of interior and exterior design in a manner that complements both. Known as somewhat of a party animal (and earning the nickname “Wild Bill Cody” in the process), his architecture is one of rigorous discipline and refinement, seemingly at odds with his partying persona. He was a wonderful planner, and the results of this brilliance can be seen at the Horizon Hotel (formerly L’Horizon), where the complex interaction of a series of bungalow buildings displays his artful ability to create wonderful interrelationships. A native of Minneapolis, Minn., Donald Wexler came to California to visit his idol, Richard Neutra. While visiting Neutra’s office, Wexler was asked to make some drawings on the spot. Impressed with the results, Neutra offered him a job. Wexler subsequently moved to Palm Springs to work in the office of Cody. “Once I got here, I didn’t want to live anywhere else,” he says. 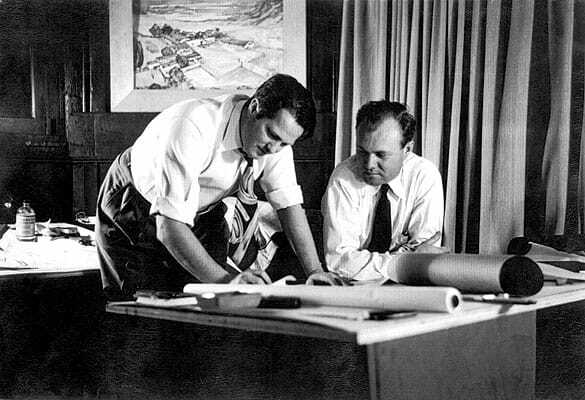 He and another architect from Cody’s firm, Ric Harrison, created the firm of Wexler and Harrison, designing virtually every type of building the burgeoning community demanded. They parted amicably, and Wexler ventured out on his own. 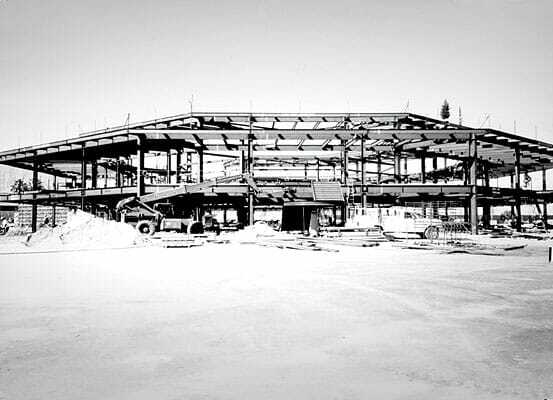 Today, he is considered an icon who truly practiced “the honesty of modernism,” wherein the structural elements of his buildings become the decorative elements as well. His widely published Steel Houses for Alexander Construction Co. are a brilliant hybrid of on-site and prefabricated construction, resulting in houses that were built in a mere four weeks. They showcase his brilliance in creating small houses that do not feel claustrophobic. In 2012, Steel House No. 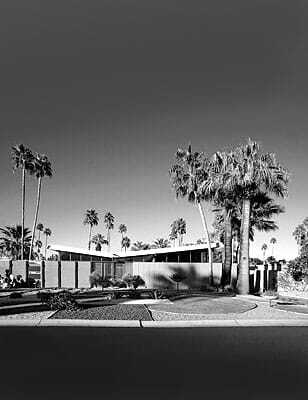 2 was placed on the National Register of Historic Places, the first midcentury modern building in Palm Springs to achieve that status. Palm Springs’ connection to Los Angeles is inextricable. Hollywood actors and studio moguls came in droves to Palm Springs, largely due to a clause in studio contracts that stated actors could venture no farther than 120 miles from L.A. during filming. Additionally, there was an unwritten rule that photographers were not to photograph the stars in Palm Springs without their consent. This led the stars to engage in all kinds of behavior without fear of repercussion in the tabloids of the day. They are the ones responsible for turning Palm Springs into a party town. Along with the Hollywood contingent came Los Angeles architects looking to be inspired by the spectacular setting. Many of them created some of their finest works here. Neutra’s Kaufmann House (1946) — designed for the family that commissioned Frank Lloyd Wright’s Fallingwater house in Pennsylvania — received enormous publicity. John Lautner designed three of his most acclaimed buildings in the desert: the Desert Hot Springs Motel (now Hotel Lautner), the Elrod House (famed for being the lair of bikini-clad, boulder-skipping villains in the James Bond film Diamonds are Forever), and the grandly scaled and architecturally significant Bob Hope House. 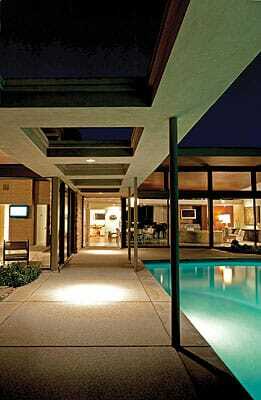 Of the Los Angeles-based firms, Palmer and Krisel contributed the most to Palm Springs’ modern style. Their work for Alexander Construction Co. created what is probably the most-reproduced style of neo-midcentury modern architecture in the desert today. The Alexander company’s goal was to take modernism, then a province of the wealthy, and make it affordable to the middle class. The genius of Dan Palmer and William Krisel’s work was that they were able to build tracts of houses with identical floor plans, but with differing rooflines and exterior materials, as opposed to the cookie-cutter tracts that cluttered so much of post-war America. 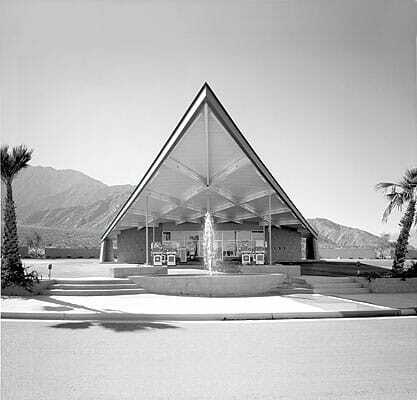 Perhaps the individual who was most responsible for letting the world know about the amazing architecture being produced in the desert was not an architect, but rather a photographer: Julius Shulman. With an unerring eye for composition, coupled with his desire to tell the story of human interaction with architecture, Shulman had his photographs published in magazines and newspapers across the globe. 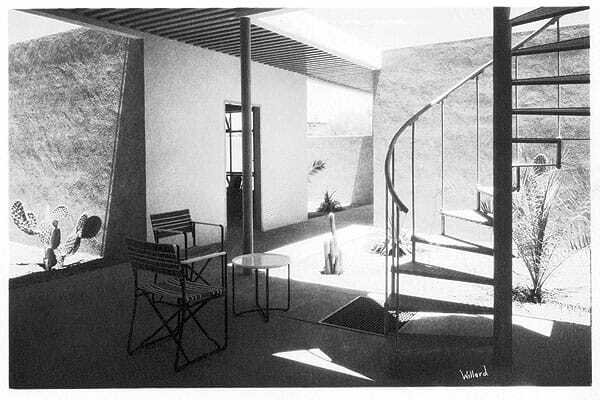 He received enormous publicity from his oft-reproduced, dusk photograph of Neutra’s Kaufmann House taken in 1947. It was Shulman’s most reproduced image until his iconic 1960 photograph of Case Study House No. 22, a modernist structure in Los Angeles. Many more people viewed Shulman’s photographs than had the opportunity to see these buildings in person, and it was through his eye that the world became aware of the greatness of modern architecture in Southern California. The 1970s and ’80s were not a great time for Palm Springs, either architecturally or economically. The Hollywood set became the jet set and were no longer encumbered by studio stipulations. Airfare became significantly more affordable, making travel to places farther away possible and desirable. Then an interesting thing started to happen in the 1990s, particularly in the latter part of the decade. Jim Moore, creative director of GQ magazine, purchased one of Wexler’s Steel Houses — and the fashion world took note. 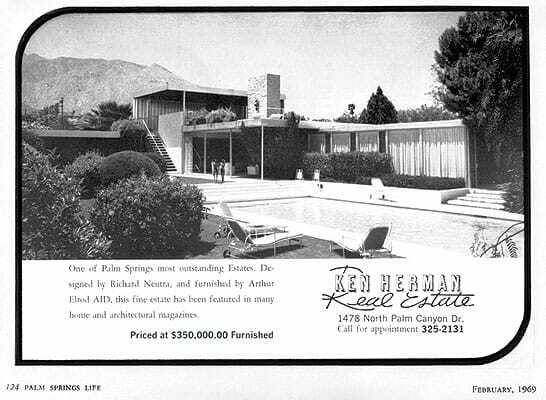 Furthermore, the meticulous restoration of Neutra’s Kaufmann House became an international sensation, and the media discovered the joys of Palm Springs’ modernism. 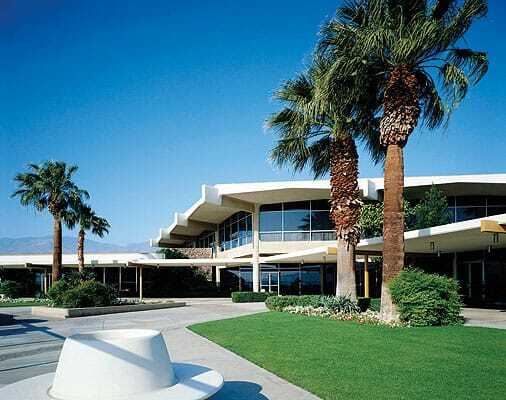 Midcentury design was appreciated anew, and the astonishing concentration of first-tier architecture that had taken place in Palm Springs became a worldwide phenomenon. This has brought a new wave of affluent, culturally oriented visitors to Palm Springs that is changing the complexion of tourism in the desert. The media has pounced on Palm Springs with aplomb, bringing with it architecture aficionados, as well as people simply curious about this thing called midcentury modernism. The style is evident in private residences as well as public buildings, and interest continues to grow. In 2012, Palm Springs Modernism Week set an attendance record of 35,400, a 40-percent increase over the previous year. Attendees came from 39 states and the District of Columbia, as well as from abroad; and the economic impact was calculated to be close to $11 million. Lovers of fine architecture are grateful that these remarkably talented individuals are receiving the recognition they so richly deserve and know that their wonderful accomplishments will serve as an inspiration for generations to come. 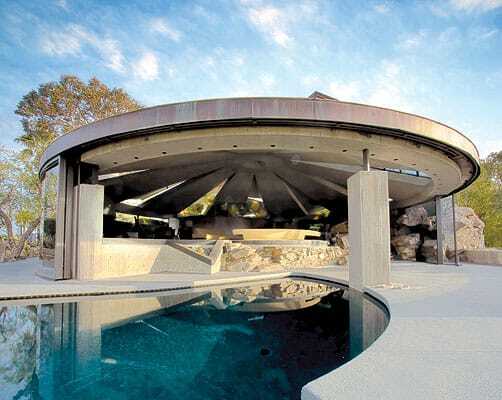 Elvis Honeymoon House (House of Tomorrow). 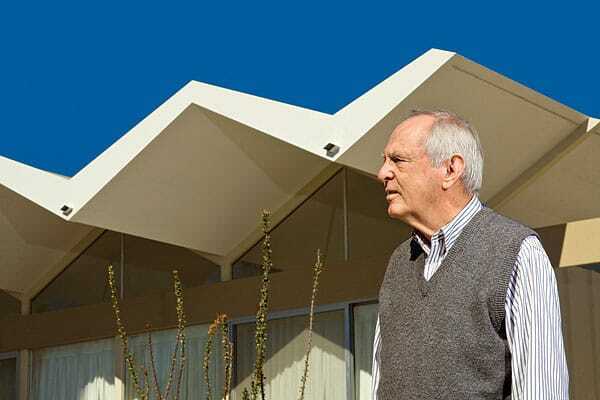 Donald Wexler in front of his folded roof house.